Be the first to share your favorite memory, photo or story of Ratilal. This memorial page is dedicated for family, friends and future generations to celebrate the life of their loved one. 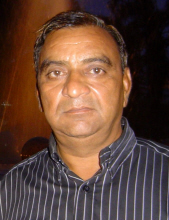 The Pooja service for Ratilal Patel will begin at 10:00 AM on Saturday, March 30, 2019. The service will be held at Sax-Tiedemann Funeral Home & Crematorium, 9568 Belmont Ave., Franklin Park. There is parking in the village lot on the south side of Belmont Ave, as well as in the village lot on the East side of the funeral home on Belmont Ave.
"Email Address" would like to share the life celebration of Ratilal Babalal Patel. Click on the "link" to go to share a favorite memory or leave a condolence message for the family.